National Stock Exchange’s (NSE)® Certification in Financial Markets (NCFM)® is an on-line testing system which tests the practical knowledge and skills required to operate in the financial markets. NCFM® offers a comprehensive range of modules covering many different areas in finance in foundation, intermediate and advanced levels. It tests the practical knowledge and skills required to operate in the financial markets. The easy accessibility as well as flexibility involved in the NCFM® programmes has resulted in its wider acceptance among market intermediaries, professionals and students. NSE® conducts several programmes such as NCFM Capital Market (Dealers) Module for those who wish to either begin a career in the financial markets in India or simply learn the fundamentals of capital markets. The course is structured to help understand the basic concepts relating to different avenues of investment, the primary and the secondary market, the derivatives market and financial statement analysis. Employees of Stock Brokers and Sub-Brokers, students, Teachers, Employees of BPO/IT Companies, Investors and for that matter anybody having interest in the Stock market operations could benefit from these courses. Taking into account international experience and the needs of the Indian financial markets, with regards for protecting interests of investors in financial markets and more importantly, for minimizing risks of losses arising out of deficient understanding of markets and instruments, NSE’s NCFM® modules are real sought after certifications. The entire process of testing, assessing and scores reporting in the NCFM® is fully automated. Login to the official site and take a pick at the certification level that interests you and suits your career goal. 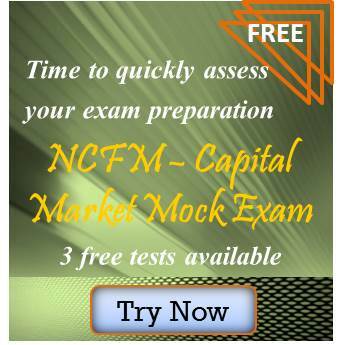 And with free NCFM Capital Market (Dealers) Module mock tests from Mockexam4u you can do just that. In this section we begin with the mock tests pertaining to Capital Market (Dealers) Module (CMDM)®. The mock exams include questions that are similar in methodology and structures to those tested by Official NSE but are not the actual CMDM® exam questions. They are only meant for self-test practice purposes. Upon successful completion of the required study and practising with these tests you will be able to master the skills to accomplish the official test with excellent grade and integrate this knowledge in your everyday work. So what’s holding you back? Commit to a conscious study in Capital Market (Dealers) Module (CMDM)® curriculum and take the mock exams offered by our site…Grab the Opportunity whilst free…Register now…..
Capital Market (Dealers) Module (CMDM)® is the first exam at the intermediate level. It is a gateway of knowledge to the capital market. The reasons for taking this course could be to understand the capital market trading operations of NSE®, understanding the clearing, settlement and risk management processes and more importantly to learn regulatory aspects and be eligible to seek membership at NSE®. There are several benefits of this module for Employees of Stock Brokers and Sub-Brokers, students, teachers, employees of BPO/IT Companies, investors and for that matter anybody having interest in the Stock market operations could profit from this module. As an employee, the certification will help be your Proof of Competence and up-to-date Knowhow in Capital Markets. Moreover it will broaden your perspective help get more responsibilities and better career opportunities compared to your peers. On the other hand, it also benefits the Investors by improving efficiency and it will also result in surge of quality deliverable and lead to work satisfaction. Although the National Stock Exchange has its own Online NCFM® modules and copyrighted intellectual property of finance resources, they have made these materials freely accessible for everybody. This is a great platform to learn and share financial market expertise. You can avail the resources for free by simply following the link and prepare for the course of which comprise of multiple-choice Test questions with negative marking scheme. 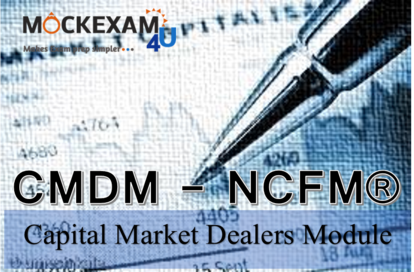 Reading the Online course module for NCFM Capital Market (Dealers) Module (CMDM)® will be very helpful for aspirants who which to acquire the know-how to pass the Examinations and to get the CMDM® Certification. 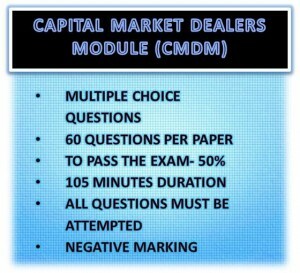 In this section we begin with detailing of NCFM Capital Market (Dealers) Module (CMDM)® which is a multiple-choice online test examination in which can be attempted at the registered test center and in some cases NSE® allows flexibility in terms of testing centres, dates and timing and provides easy accessibility and convenience to candidates. The test comprises of 60 questions and must be completed in 105 minutes in a single session and answer all of the questions. In order to pass the examination and to obtain your NCFM Capital Market (Dealers) Module Certification you need to correctly answer at least 50% of the questions. There is negative marking for incorrect answers. For successful candidates, certificates are valid for 5 years from the test date. A CMDM® correlates capital markets and other growing fields in the area of finance. This module aims at creating a better understanding of the various concepts/principles related to capital market. This module aims at providing a basic insight about fundamental analysis and various valuation methodologies used in the capital markets. For a career in financial markets, such NCFM® certifications hold a great value. Also one of the requirements for admission to membership on the NSE is to pass an on-line examination under NSE’s Certification in Financial Markets (NCFM). Therefore, it is advised to obtain Capital Market (Dealers) Module Certification. For more tips on the exam questions refer to the official website of NSE’s Capital Market (Dealers) Module by following this link. Mockexam4U could give you an understanding of what to expect at the NCFM CMDM® Exam. To find out how? Register for Free …Now!!! Mockexam4u is an ideal space to test your Capital Market (Dealers) Module (CMDM)® framework through our online portal. Credibility and Acceptance of CMDM® in India has made the modules quite a sought after certification. The National Stock Exchange (NSE)® values the know-how gained from reading and self-study or from any other medium and experience. Thus we at Mockexam4U have prepared mock exams to just help you with this cause. The mock tests in this section are designed to help prepare you for the Capital Market (Dealers) Module (CMDM)®. The sample exam comprises of 15 questions that would enable you to assess briefly your understanding of the topics covered in the Capital Market module exam. The sample test of provides a glimpse of the actual examination questions. 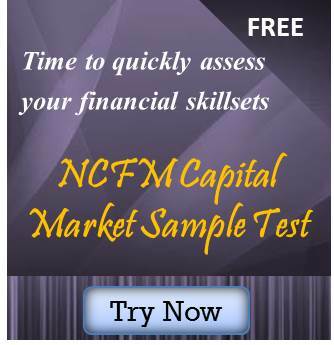 Click the image above to check the NCFM Capital Market (Dealers) Module (CMDM)® sample exam. It would give you a sneak peak at what you could expect in the actual NSE’s capital market module credential exam. This sample exam encompasses 15 questions and is not time bound. This section is provided to give you an understanding of what to expect at the Capital Market (Dealers) Module (CMDM)® Exam. Our group of certified CMDM® and financial practitioners have carefully designed each of the sample and mock exams to ensure the entire syllabus is covered and you the reader get the utmost benefits. The feedback after every question will tell you the right answer and the corresponding explanation. The sample questions are similar to questions from the CMDM® curriculum but not from the actual exam and is provided here to help you prepare for the exam. These review questions do not reflect the actual questions you will receive on the live certification exam. They are only meant to supplement your exam experience. It would be prudent to take as many exams as possible to boost confidence and to test your preliminary assessment levels. If you feel you are benefited with the sample exam please do register by following the link below and get a chance to attempt the other 3 Capital Market (Dealers) Module (CMDM)® Mock exams with 60 questions each for your practice. This online test remains the property of the Mockexam4U. The Capital Market (Dealers) Module (CMDM)® sample questions and the online tests are not from the official International Scrum Institute’s sample papers and they are created by our organization. These test questions are not to be reproduced or re-sold without our permission. Enjoy the exam whilst free! Each of the exams is vigilantly questioned with each question differing from the other to ensure the entire Capital Market Intermediate course material is covered. Also click this link to attempt the other CMDM® Mock Exams. Do give us your precious feedback so that we could cater more easily to your needs. Fancy becoming a knowledgeable Capital Market (Dealers) Module (CMDM)® Certificate holder?…Assess your preparatory skills with these brain teasers and alleviate exam qualms if any…An Ideal space to test your Capital Market exam knowledge and make waves for a bright career in Finance industry. This Mock Exam section comprises of two types of exams namely: The mock exam and the practice exam. The Capital Market (Dealers) Module (CMDM)® mock exam is time bound with 105 minutes as the end time, whereas the practice exam focuses on testing how much an individual understands from basic Capital Market concepts and is not time bound. The former tests your prep from exam point of view and lets you know if you are ready to take the plunge. Whereas the latter helps you prepare yourself better from an exam and concept viewpoint and give a feedback for every question. The mock exam comprises of similar number of questions in terms of length and time duration, as you can expect on the final day which would be a computer-based examination. Please select your option from the above mentioned online tests to test your preparation level. The scores would be displayed at the end of the entire test and a feedback email would be sent to you on the registered email address. This certificate is appropriate for those working in a stock market environment – or where financial services are a core competency. This may include but is not limited to, investors, stock brokers and sub-brokers. It is mainly for financial Professionals who are passionate about the Capital Stock Market. Ideal approach for obtaining the maximum benefit from the tests would be that you make sure the course material is thoroughly understood from CMDM® examination point of view and you have marked a date on your calendar to give a test. Our groups of Capital Market experts have carefully designed each of the tests and the training docs to ensure the reader gets the utmost benefits. Get ready for a wonderful and challenging experience. This online test remains the property of the Mockexam4U. The NCFM Capital Market (Dealers) Module (CMDM)® sample questions and the online tests are not from the official International Scrum Institute’s sample papers and they are created by our organization. These test questions are not to be reproduced or re-sold without our permission. Enjoy the exam whilst free! Each of the exams is vigilantly questioned with each question differing from the other to ensure the entire Capital Market Intermediate course material is covered. Hope you find the CMDM® Mock Exams useful. Do give us your precious feedback so that we could cater more easily to your needs. The National Stock Exchange (NSE) is an independent Organization which helps financial Companies and Professionals to get certified with NCFM® examinations and to prove their competence in stock market domain. An aspirant could obtain instant recognition from all financial arenas once they secure a NCFM® Certification. So how does one complete the NCFM Capital Market (Dealers) Module CMDM® Certification? The overall process couldn’t be any simpler and is easy and fast. To make life simpler we have enlisted the pointers to be remembered. Candidates can register online by accessing the link for Online Registration available under Education>Certifications>Online Register / Enroll. Once registered, you will get a unique NCFM® registration number along with a user id and password. Confirmation will be sent to the email id and mobile number entered during registration. Using the same, you can access your online NCFM® accounts to make payment / enroll for test / update address / check study material status / view certificates etc. Candidates can make payment online by accessing their online NCFM® login through the login page available under Education>Certifications>Online Register / Enroll. Only one should remember that the Test fees are valid for 180 days from the date of payment. Candidates need to enroll for the test(s) within 180 days from payment of fees and the fees once paid shall not be refunded. Study material for NCFM® modules is dispatched to reach within SEVEN working days from date of payment.